In a recent incident, beauty queen Miss Peru 2019, Anyella Grados has been stripped of her crown and title on Wednesday. 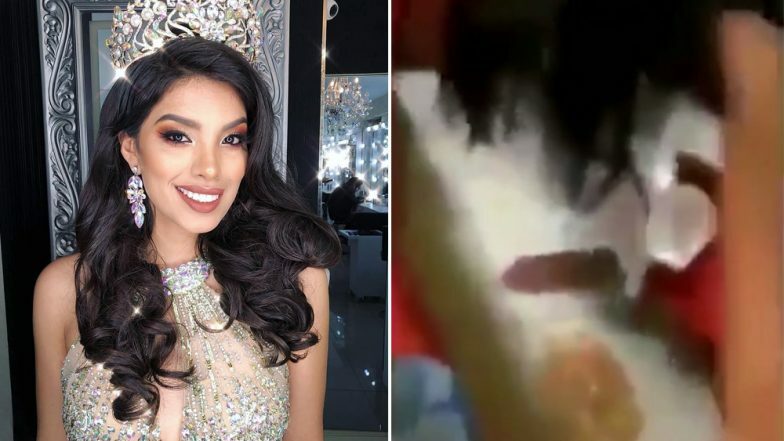 The reason behind this punishment for the 20-year-old Peruvian beauty queen, is that she was filmed drunk and vomiting after partying at a nightclub in northern Peru last week. In no time the footage of tipsy Miss Peru went viral online, and it showed Ms Grados drunk-puking and almost out of her senses. The footage was reportedly recorded by Miss Teen Peru Camila Canicoba, as per reports by Daily Mail and she also explained that she wanted to just privately share the video, however, she uploaded publicly for people to see it. The beauty queen has been stripped of her crown and won't even be able to compete for the Miss Universe title after the video of her appearing drunk, and vomiting has gone viral. However, in a statement, Ms Grados has claimed that she will be taking legal actions against being recorded without her consent. In the video, the 20-year-old beauty is seen absolutely drunk and is struggling even to sit upright and soon after that she sees slouching and throwing up beside her on the floor. "I will take the legal actions against the person who ... has filmed without my consent and then spread the images that impinged against my honour and my reputation," Grados said in a statement obtained by Daily Mail.